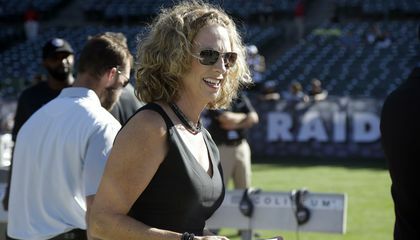 ESPN has tapped Beth Mowins to call the second part of a season-opening "Monday Night Football" doubleheader. It will be in September. She will be the first woman do play-by-play duties on an NFL game in 30 years. The network says Mowins will team with former NFL Coach Rex Ryan when the Los Angeles Chargers visit the Denver Broncos. That is on Sept. 11. Mowins joined ESPN in 1994. She has called college football for the network since 2005. She has also done play-by-play for preseason Oakland Raiders games. Those games were broadcast locally. ESPN Senior Vice President Stephanie Druley says Mowins "deserves this opportunity." Why aren’t more women involved with the NFL? Women tend not to like football as much as men. Also, many broadcasters were former players or coaches. Football is a tough game and no women ever played on an NFL team. Women can do anything a guy can do if they want to. I know of two girls who played football and absolutely loved it like that was their entire life. It may be odd at fist but don't down grade a women just because she is a women. us women are just as powerful as men. People don't think women have what it takes to be involved in the NFL. Yes, yes we do. We can do anything! No idea, 2017- 30 = 1987. Maybe that has something to do with it?